The contractor reported that during the trial of the AQ4XL on the Kobelco SK350 LC excavator, the production rates exceeded the guaranteed production quota listed above. 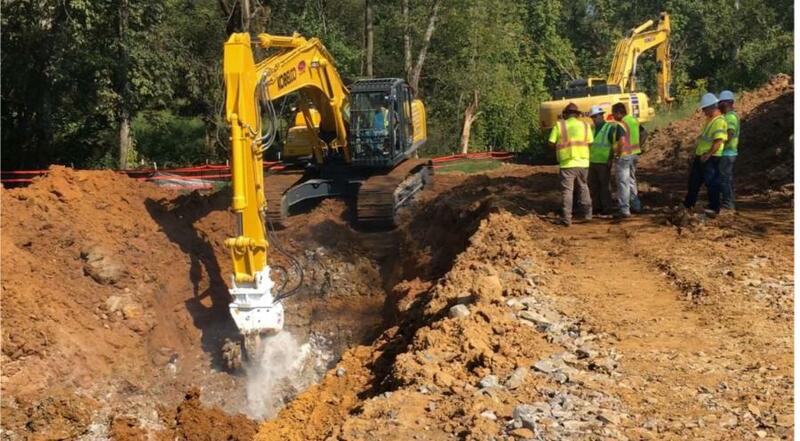 The production goal for the contractor in Knoxville, Tenn., was to lay five 20-ft. sections of pipe per five-day work week. The site required a trench to be dug through dense limestone rated between 16,000 and 22,000 psi. The contractor tried many other conventional trenching methods, but none of them were able to keep up with production goals and keep project costs in line with the budget. With a hydraulic breaker, for example, it was a struggle to lay one 20-ft. length of 36-in. diameter pipe in a week, far short of the five sections goal required. The contractor reached out to his local Antraquip's dealer in Tennessee in search of a better solution to the trenching challenge. After a site inspection by both dealer and Antraquip factory personnel, a production and cost proposal was presented to the contractor. The proposal was made to do a trial with an AQ4XL hydraulic rock cutter mounted on a Kobelco SK350 LC excavator. The proposal also included a guaranteed production of no less than 200-plus ft. of 20-ft. pipe (10 sections) in a five-day work week, double the contractor's initial production goal. The contractor reported that during the trial of the AQ4XL on the Kobelco SK350 LC excavator, the production rates exceeded the guaranteed production quota listed above. This equates to 10 to 12 cu. yds. per hour of production vs. approximately 1 cu. yd. per hour achieved with hydraulic breaker. The AQ4XL's 215-hp motor provides up to 28,120 ft.-lbs. of torque and up to 24,068 lbs. of cutting force to cut the very dense and hard limestone. Even so, the pick/bit consumption has been reported to be very low due to the low abrasion nature of the limestone. Since the trial period began, the AQ4XL has allowed the contractor to exceed his production goals and is helping to bring the project back into budget. The Antraquip AQ4XL hydraulic rock cutter cut through dense limestone more quickly than a hydraulic breaker, allowing a contractor to meet the goal of laying five 20-ft. sections of pipe per week. Antraquip's corporate headquarters is located in Hagerstown, Md.